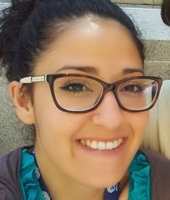 Dr. Francesca Gabrieli is a fellow at the CNR-ISTM UOS Of Perugia. In 2009 she obtained the bachelor degree in Chemistry, University of Perugia, dissertation title “Identificazione di fenossazoni in tessuti tinti con orceina attraverso spettroscopia SERS”. In 2011 she obtained the master degree in Chemistry, University of Perugia, dissertation title “Sviluppo di una metodologia SERS per lo studio non invasivo dei coloranti”. On January 2012 she obtained a studentship with CNR-ISTM UOS Of Perugia for the study of material paintings through Raman and SERS spectroscopy. In December 2012 she began her Ph.D. in Chemistry at the University of Perugia supported by a research grant by CNR-ISTM UOS Of Perugia within the FUTURAHMA project. She participated in the in situ measurements for the FUTURAHMA project at the Estorick Collection (London), Vittore Grubicy collection (Livorno) and Dottori Collection (Perugia) and also in some measurements for the CHARISMA project (such as at Museo Picasso in Barcellona and in Antibes). A. Nevin, S. Bellei, R. Fontana, F. Gabrieli, F. Rosi, C. Marchese, M. d’Ayala Valva, D. Kunzelman, E. Buzzegoli, and M. Patti, Futurist Painters – Interdisciplinary research on written sources, artists’ materials and paintings, in ICOM-CC 17th Triennial Conference Preprints (Melbourne, 15–19 September 2014) edited by J. Bridgland, art. 1309, Paris, International Council of Museums (ISBN 978-92-9012-410-8).